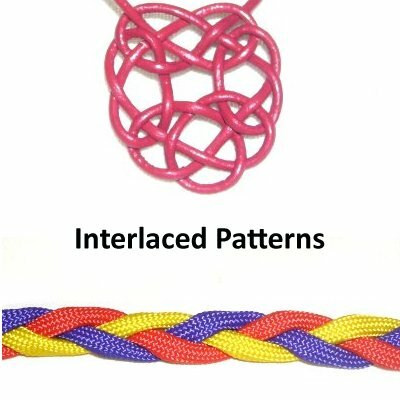 Macrame Terms contains descriptions of the unique words and abbreviations found in Macrame patterns, starting with the letters A - L.
The definitions, information, and images in the entire dictionary will help you understand written patterns, especially if you are a beginner. Navigation Tips: Clicking on the images will bring up larger photos. Clicking on the links will bring you to the pages described in the text. Refers to cords or knots resting next to each other. 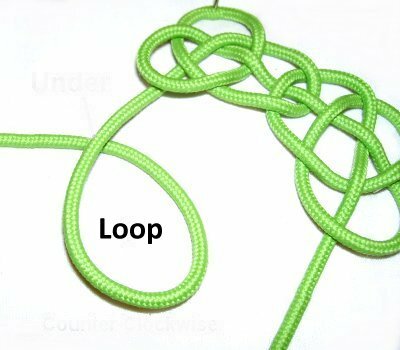 The two loops indicated in this Mystic knot are adjacent to each other. Knots and patterns where you switch back and forth between colors and/or direction. 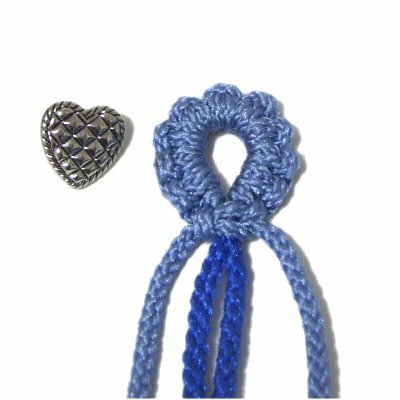 This is the Alternating Half Hitch, which is a great example of how knots can be tied in both directions. 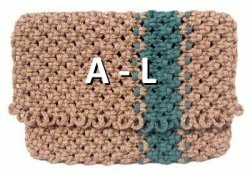 This abbreviation is one of the most frequent Macrame terms you will see in patterns. Alternating Square Knots are used in many types of projects. 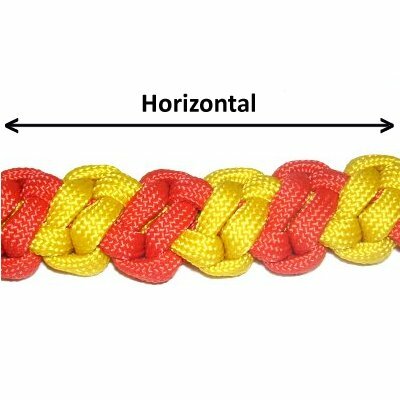 A type of knotted design that is wide and flat. This is the Icelandic Dream Bar. A raised area made by Double Half Hitches is also called a bar. 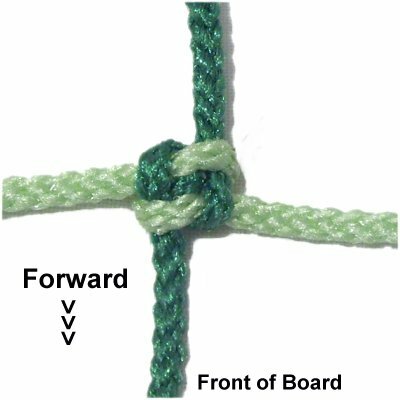 A narrow folded segment in a cord, which is usually pushed through loops or other portions of the knot. 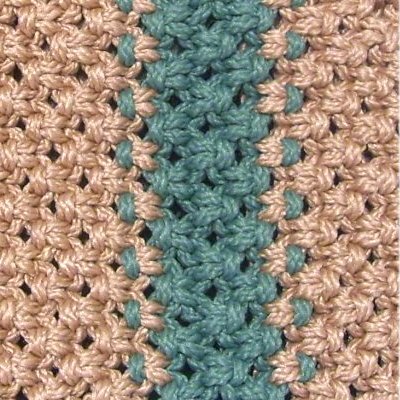 Macrame terms are often used differently than in other crafts. 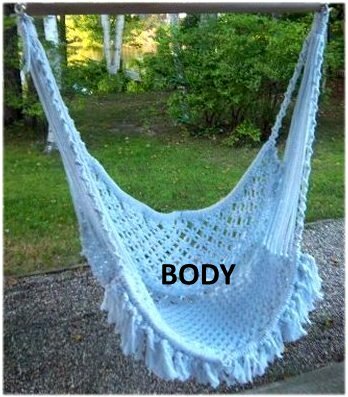 The body of a Macrame project is the main area. For this Hammock Chair, that would be the back and seat. 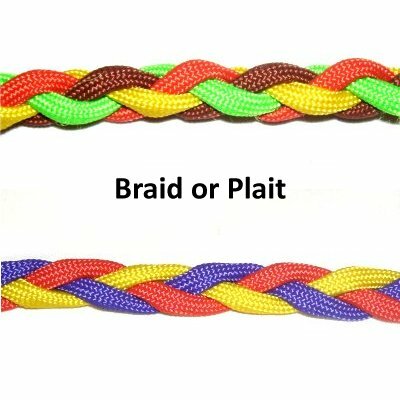 Also called a Plait or Braiding, this term refers to a type of knot design made by weaving and crossing several cords. 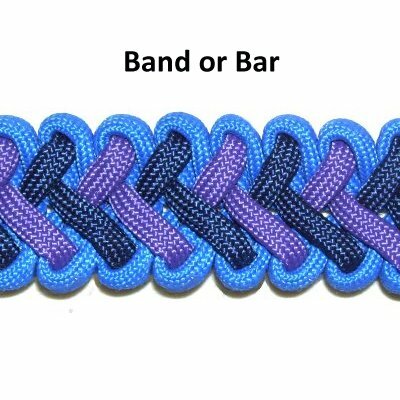 Several styles are located in the Learn Macrame page, in the Braids and Bars section. 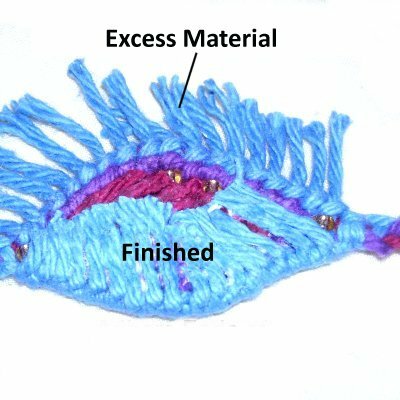 A type of material in which the individual fibers are braided to form the cord. Refers to a group of cords gathered together. Usually a knot is tied around them. This is frequently seen at the top and bottom of Plant Hangers, like this Two-Tone Planter. 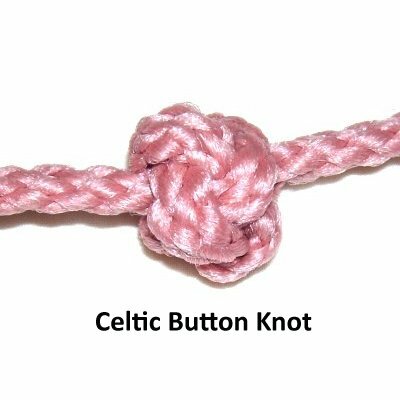 A type of decorative knot that is round and firm, like the Celtic Button Knot shown here. Macrame terms like this are unique to this craft. 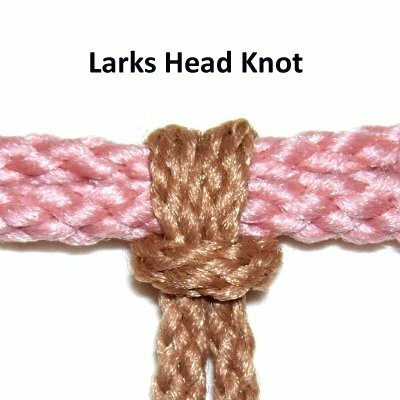 The Vertical Larks Head knot is used to create loops that are sometimes called "Buttonhole designs". See Buttonhole Clasp for more information. Artistic knot patterns and symbols that originated in Europe, particularly Wales, Ireland and Scotland. The Celtic Triangle shown here is derived from the symbol for the Trinity Knot. 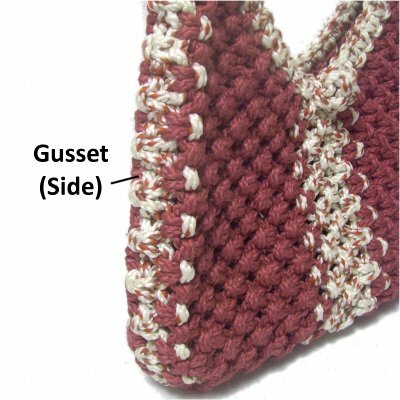 Macrame terms can sometimes be used in more than one way. The term "center" is used to describe the middle of the design. 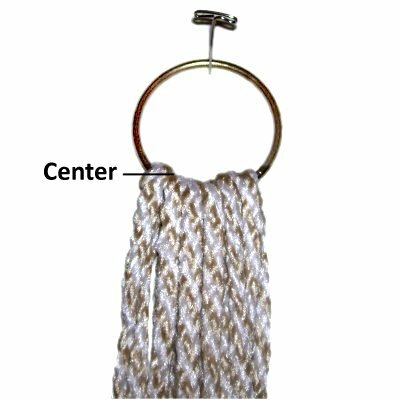 Center is also used to describe the ACTION of matching the ends to balance the cords. In this image, the ends were matched so the center point was on the ring, and both halves were the same length. Decorative knots that originated in China. 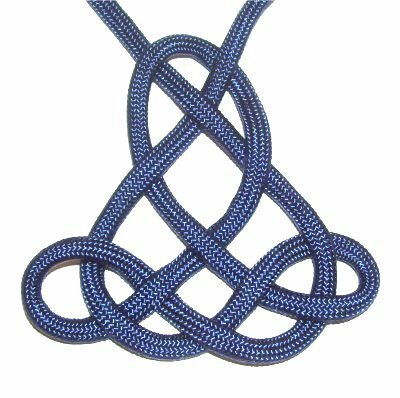 Many of these elaborate knots feature beautiful woven areas and loops. This is the Good Luck Knot. A long piece of rope or thread made from fibers twisted or braided together. The types used in Macrame are described in full detail in Natural Materials, as well as Synthetic Materials. 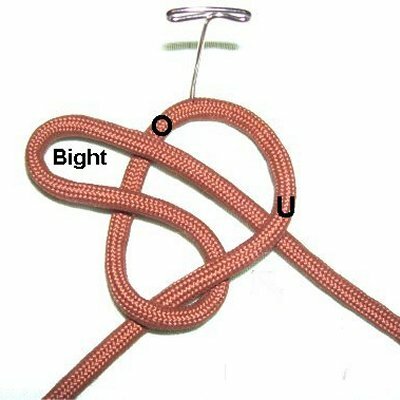 A group of several cords that run through the center of a knot. 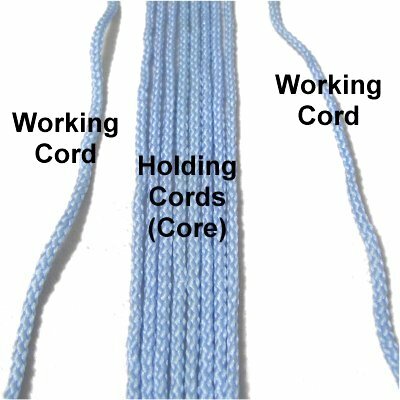 The working cord(s) are used to tie the knots around the core. The rounded area on loops, directly across from the crossing point. 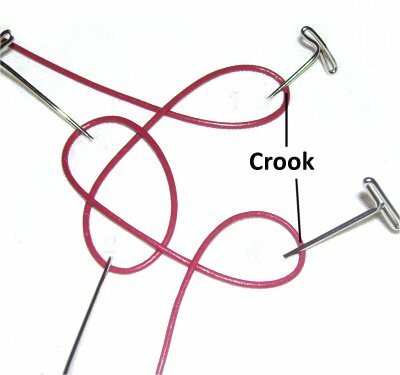 In this image, a pin was placed at the crook of each loop. A cord, or row of knots, that runs from upper left to lower right (or the opposite). 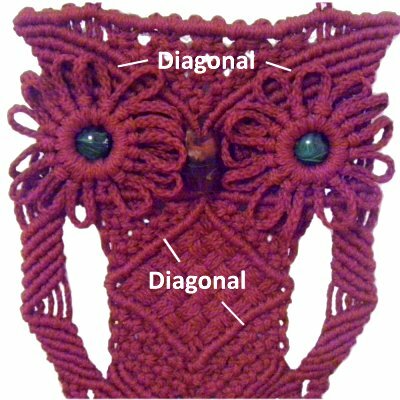 This is the Owl Pouch, which has several areas of diagonal designs in the head, body, and wings. 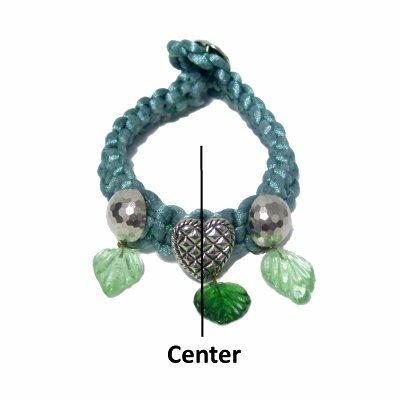 The measurement of a bead, ring, or cord from edge to edge (or side to side). 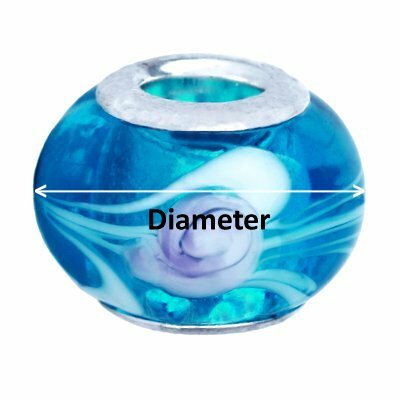 This size is usually described in millimeters, especially for cord materials and beads. 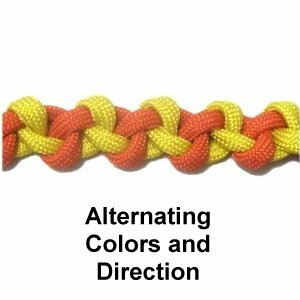 This abbreviation is commonly seen in both Macrame and Micro-Macrame projects. 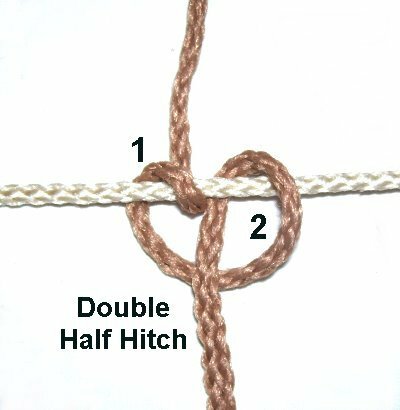 A Double Half Hitch is made with two Half Hitches, which are the two loops shown here. The cord material left over at the completion of the Macrame project. They are usually finished off in some manner. See Finishing Techniques for more information. 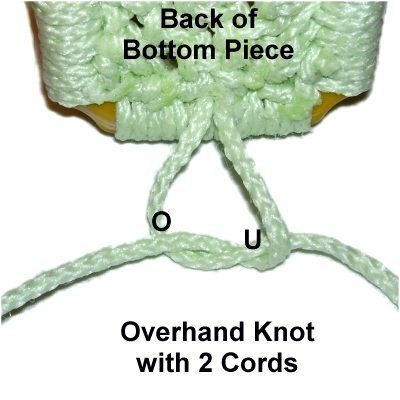 One of the most frequently used Macrame terms, this describes cords that run through the center of certain knots. 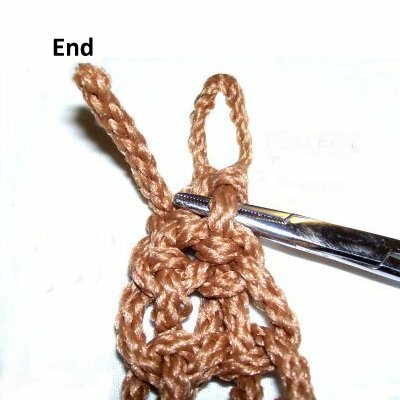 The process in which the ends of the cords are either tied off, or tucked in, at the completion of a Macrame project. See Finishing Techniques for details. 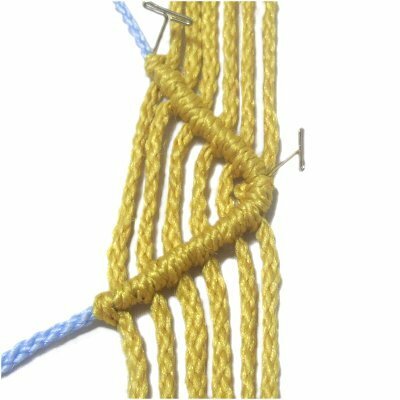 A class of knots used to tie off cords at the end of a Macrame project. They are easy to tie and have a strong hold. 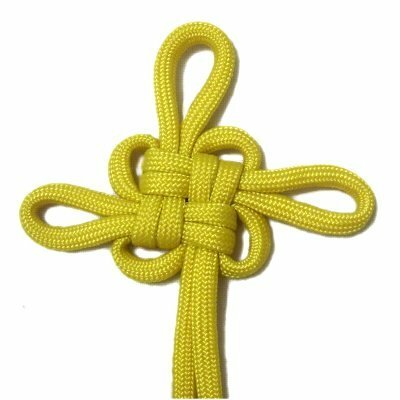 The Overhand knot shown here is the most common finishing knot. 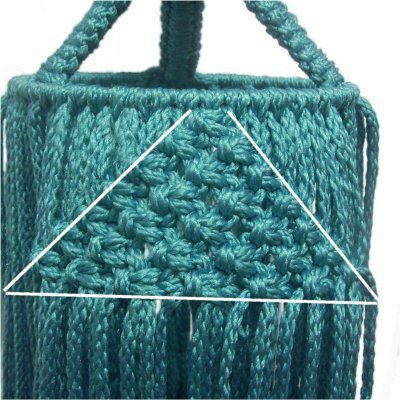 Macrame terms like this one are frequently seen. 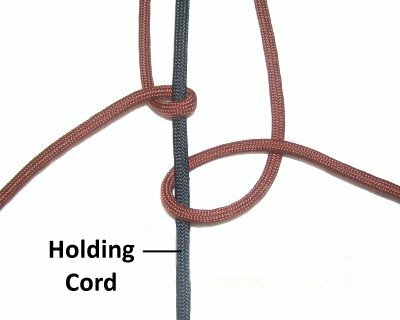 When you are asked to fold a cord around another, you bend the cord, then turn it upside down. The bottom surface that was touching the board should be face up. This term means the cord is heading towards the front of the project board. This is the Crown Knot. The dark green cords are heading forward and backward. 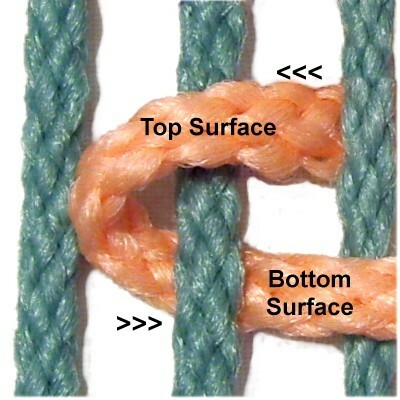 A finishing technique in which the ends of the cords are unraveled or beaded. 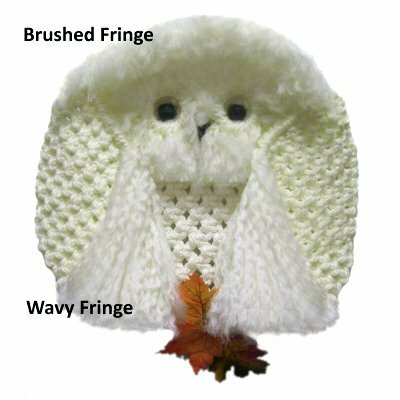 Unraveled cords can be brushed smooth, or left wavy, as seen in this Snow Owl. 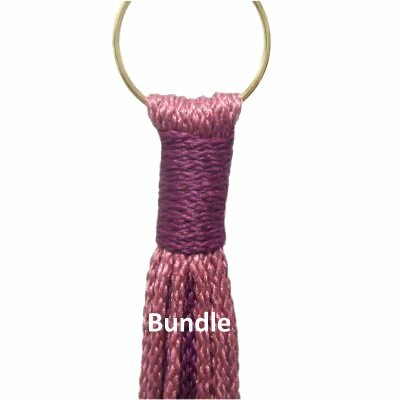 Unique decorative knots that combine elements of two or more knotting techniques. Tutorials for many of these designs are in the Learn Macrame section. 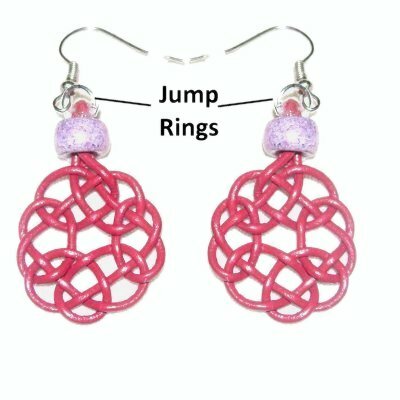 Visit the Fusion Knots website for details. A silver or gold metal piece that lines the hole of some European beads. 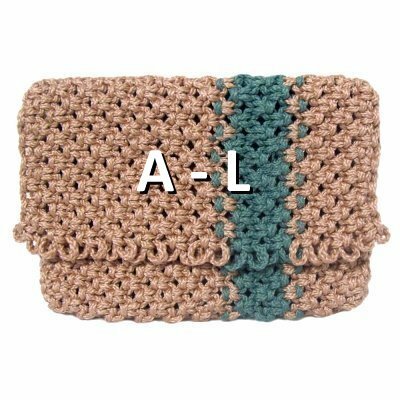 A knotted area on the side of a handbag that expands it, so the front and back are separated. Sometimes the shoulder strap is used to create space between the back and front. 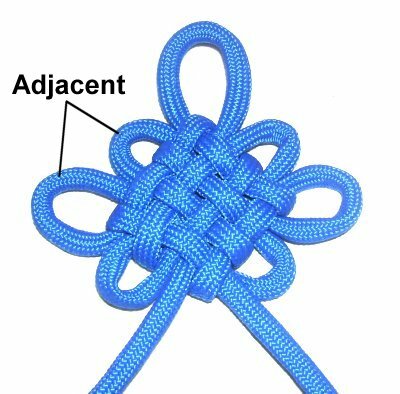 A class of knots that are attached to an item like a ring or dowel. They can also be attached to holding cords. 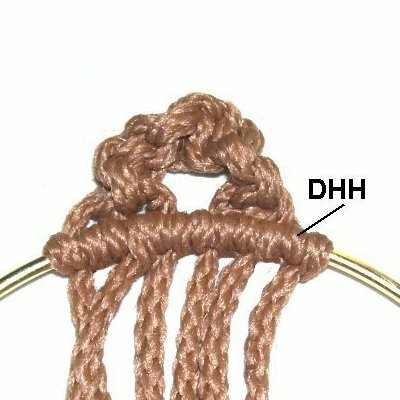 The Double Half Hitch (DHH) is the most common type used in Macrame. 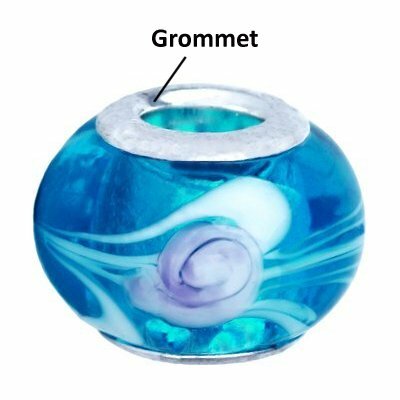 This is one of the most frequently used Macrame terms. It's used to describe one or more cords that hold and support the knots made by working cords. Also called the knot bearer in vintage patterns. 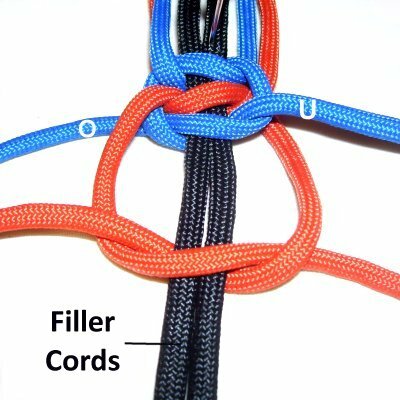 Patterns, knots, or cords that are arranged from left to right, or from right to left. 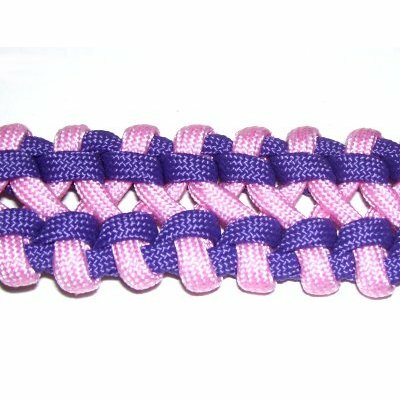 A pattern where you intertwine, braid, or weave the loops (or cords) together, to link the different areas. The top image is the Celtic Circle, and the one on the bottom is called the King Solomon Braid. Term used to describe something upside down. For example, a V shape normally has the narrowest area (point) at the bottom. In this image, the V is inverted, with the narrow area at the top. 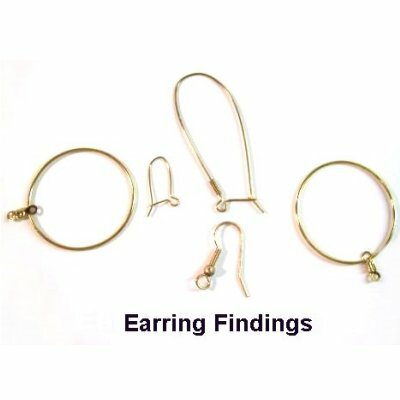 Fine metal connectors used in jewelry making, such as hooks, clasps, hoops, etc. A small metal ring with ends that are not soldered together. The two ends can be separated, then crimped shut with jewelry tools. 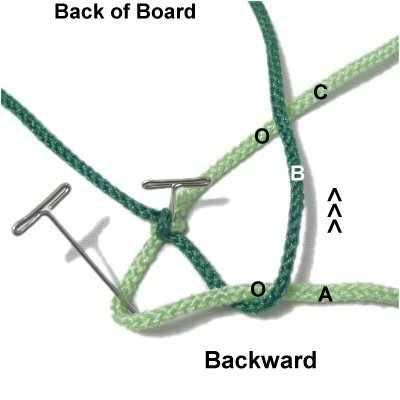 The most common mounting technique is the Larks Head knot. It's used to attach cords to rings, dowels, and other cords. 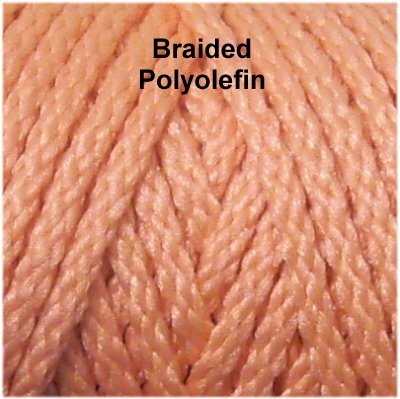 This is one of the most important Macrame terms on this site. A loop is a circular or oval shape, and is made by crossing one part over another (crossing point). 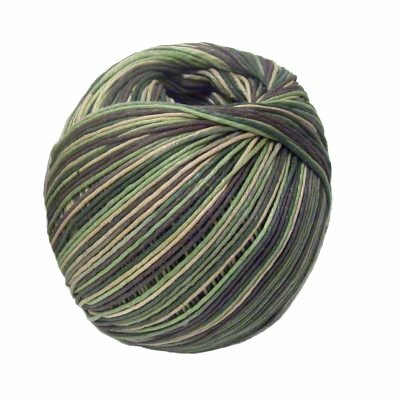 Have any comments about these Macrame Terms? Contact Me.